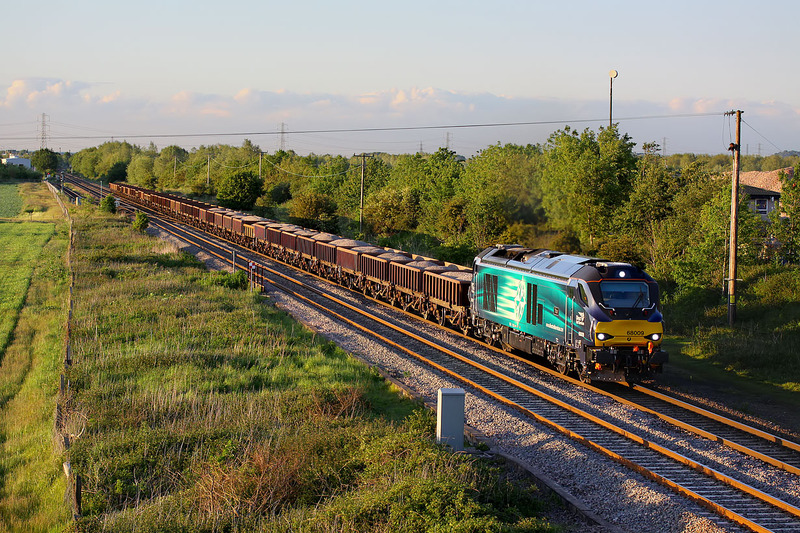 In superb low evening light, 68009 Titan slowly approaches Wychnor Junction on 3 June 2015 with the 6Z97 19:38 Toton to Crewe Basford Hall ballast. A feature of the Class 68 is the provision of very bright headlights. However, due to the pulse width modulation control for the LED lights, they don't always appear to be on when photographed, due to the shutter of the camera firing during the 'off' cycle. This also results in apparent flashing lights on video. In order to get a picture with all three lights correctly lit, I take a six frame per second burst to make sure one looks right. This doesn't always work, as even at six frames per second the optimum position for the loco might not match up with the best lights picture. No such problems here however!